Synopsis: A Harvard scientist conducts experiments on himself with a hallucinatory drug and an isolation chamber that may be causing him to regress genetically. Review: Back in the days when I worked at Mr. Movies, from my perch behind the counter I could see the front part of the horror section. 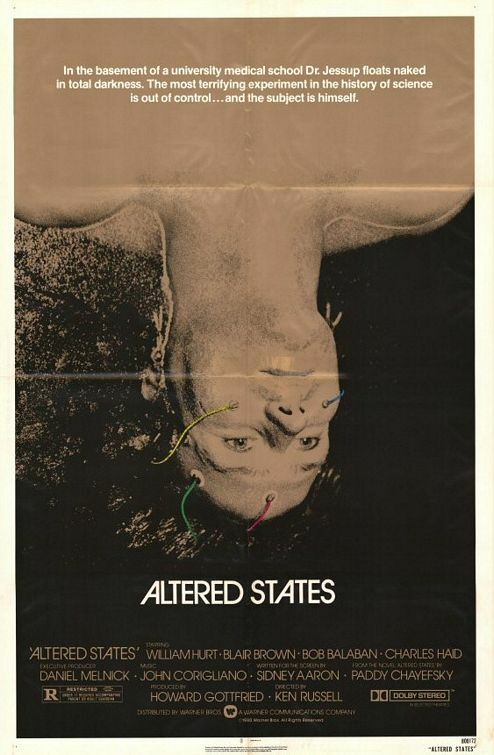 Always in my line of vision was the box for Altered States and I found myself trying to twist my head upside down to see William Hurt’s face whenever I was bored. Often times customers would turn the box over thinking it was a mistake and I’d go out there and make sure Hurt was appropriately upside down again. C’mon, when you looked at the poster above you turned your head a bit too, right? Well even with all the free rentals I could ask for and a healthy love for horror Altered States never came home with me for a viewing and it was only when I saw it coming up on television that I decided it was finally time to give it a go. True, even after I recorded it it sat on my DVR for about four months and it’s been at least that long since I actually saw it…but at least I finally saw it. After taking in Ken Russell’s film adaptation of Paddy Chayefsky’s novel of the same name, I’m not sure if I wouldn’t have been better served just admiring the old VHS cover art instead. Filled with a lot of new age (for the time) mumbo-jumbo and some unfortunate make-up and special effects, Altered States won’t, ahem, alter your take on the sci-fi horror genre and may just leave you banging on the walls of your isolation chamber to get out. In 1980, the isolation chamber was a decade out from its popularity in the 70’s for its meditative benefits. A scientist (Hurt) is experimenting with hallucinatory drugs he learned about in his studies in Mexico…combining these drugs with the sensory deprivation of the isolation chamber he begins to test his theory that our “altered states” can be just as real as being awake. As is custom, the doctor pushes the limits farther and farther with each session until he starts to regress into a caveman-y/ape state. It’s a strange, strange film that rides the wave of the late 70’s psychedelic kick that was nearing its critical mass. I haven’t read the novel by Chayefsky but it’s interesting to note that this was the last film the Oscar winning screenwriter was a part of before his death a year later. Why Chayefsky used a false name when writing the screen adaptation of his only novel is curious to me…and I’m wondering how many differences there were between the book and the movie. In his first film (and starring role), Hurt is confidently egotistical in a mannered way so that you don’t hate him too much off the bat. Clearly a driven intellectual, he throws himself whole hog into the film’s more challenging moments as only an actor of his nature could. He’s ably supported by Brown as a colleague and love interest that can only watch as the man she loves and the peer she admires starts to go off the deep end. I wouldn’t really classify this as a horror film but a sci-fi drama that has swaths of horror painted into its crevices as the film progresses. I’ve a feeling that some late in the picture developments that focus on scares/gore were added to round off the picture but, again, not knowing the source material that’s only speculation. A (very) modest hit, the picture did well with critics and was different enough to have gained a cult following the years that followed. I didn’t see much to write home about actually, and I feel like I can just chalk this one up to be another older flick that I wondered about for a long time and can be satisfied that I put my curiosity to rest.